Fire Chief Thomas Stadler looks on as Township Supervisor Karyn Miller presented a certificate of appreciation to Assistant Fire Chief Mike Burkley. FLINT TWP. — When former Fire Chief John Ringwelski retired in April 2015, Assistant Fire Chief Mike Burkley stepped into his shoes and wore two hats for the next 26 months. 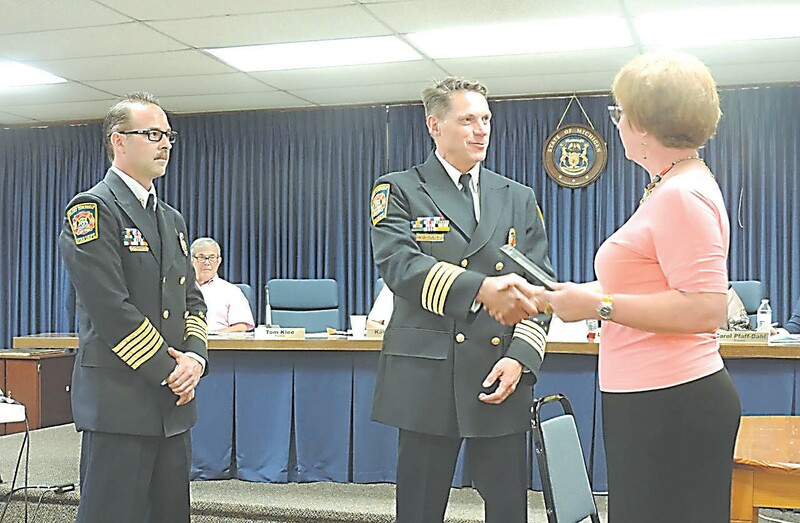 Last month, the township board promoted former Fire Captain Thomas Stadler as the new fire chief, based on the recommendation of its Civil Service Commission. At the township board meeting this week, Burkley was formerly thanked, applauded and given a certificate of appreciation. Township Supervisor Karyn Miller acknowledged Burkley’s more than two years of filling two roles. “We want to thank you for your service. You did a good job,” Miller said. She cited his efforts in getting grants for fire and safety equipment and overseeing the specifications for a new fire truck which arrived in late June. Miller said that Burkley will continue to work as a full-time officer at station one. Burkley is no stranger to special recognition. He was named 2012 Firefighter of the Year by the Genesee County Association of Fire Chief’s for his work in getting a grant to buy a training trailer. Burkley was first temporarily promoted to Assistant Fire Chief in January 2010 following the retirement of Assistant Fire Chief Mark Rowley. He was permanently promoted in July 2011.